I showed you the beginning of this painting in my vlog a few weeks ago and I wanted you to see the finished product. I'm excited to be starting this new twin series; I'll share more of them as they're completed. It's a of bit tongue-in-cheek silliness. My corny side's come out to play. Speaking of play, I may be going to see the musical, Seussical tonight. What are your plans this weekend? I hope they involve some sort of silliness. That background green color is a favorite of mine! You've had a lot going on lately! Here's hoping your son gets an even better job and enjoys his freedom in the meantime. Love the faces. This will be a quiet weekend. Services, lunch with friends, and maybe a movie. I'm hoping to do some house projects and enjoy the air conditioning, too. I love quiet weekends. Yours sounds like a beautiful plan. I like the details in the artwork, the eyelashes, etc. Fun in the park and on the lake this weekend. Park and lake both sound fun, Peaches! Love it! Wombmates... adorable! What a whimsical painting! Cute! Have twin grand kids, but never thought of them as wombmates. Well actually I have wondered what it was like for them being in the womb together, however, that word never came to mind. Cute! Very cute and fun. Love the eye details! 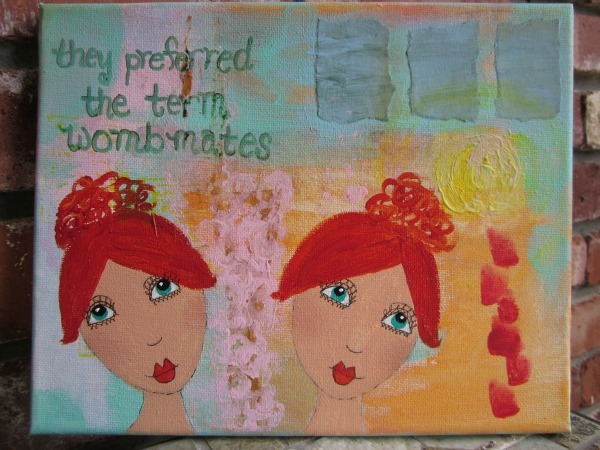 wombmates - what a great concept! lovely piece too! I like the idea because even if I can't remember it, I enjoy that we started life together. Thanks! 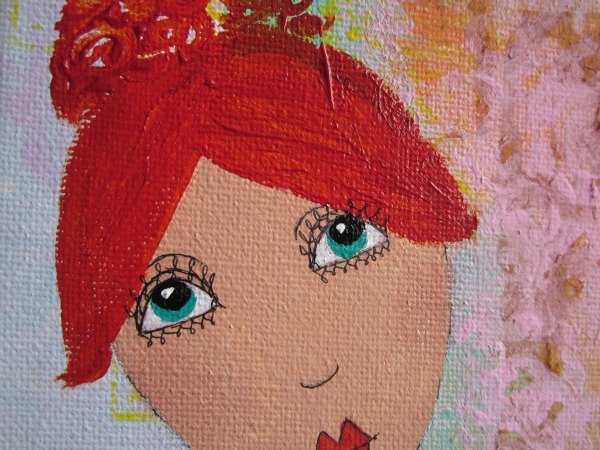 So glad your corny side it out- the paintings are such fun! I love your playfulness here!!! 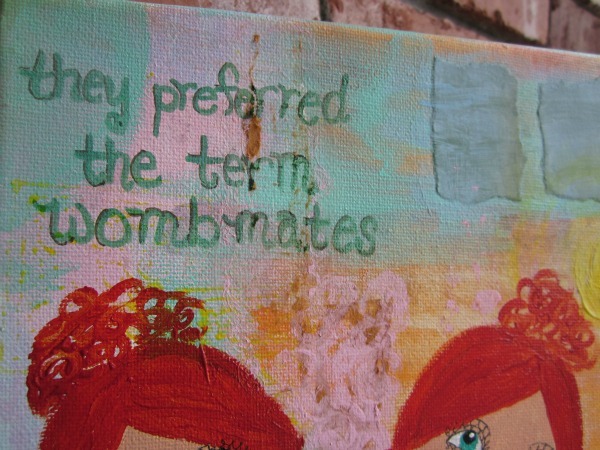 wombmates-- tee hee hee. 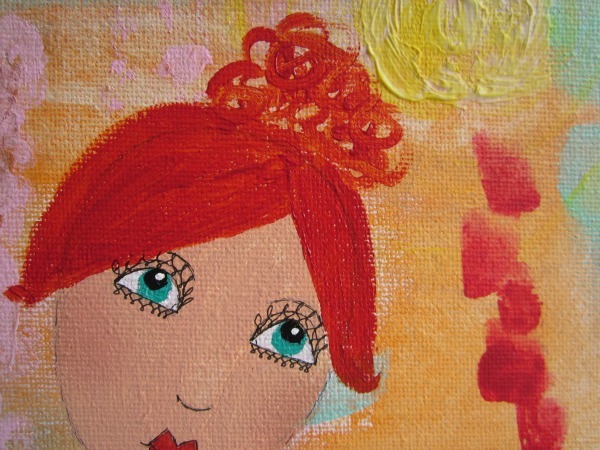 love the bright colors you used for the hair and eyes. and i'm envious-- i bet seussical is going to be lots of fun! I giggled the whole time I wrote it and I wasn't sure anyone else would "get it". But I shouldn't have been worried! :D p.s. Seussical WAS fun! This is so cute! Reminds me of a comedy skit Howy Mandel did in the seventies about wombmates!! It was so funny!! Adorable! So exciting to see your finished piece in this new series! Love your color palette and textures!! I love your girls. Their eyelashes are always so darling. Wonderful! Happy PPF! How awesome that they could see your passion without a word! Your twins are ultra cute! We saw HONK this weekend...it was really funny! It's was a live show based on the Ugly Ducking. We laughed all evening. Thank you! I'll have to see Honk. I love fun hilarious movies. your painting style is amazingly gorgeous!